Fort Wayne, Indiana, has sister-city arrangements with several cities in other countries, including Takaoka, Japan. The annual Cherry Blossom Festival is one element in Fort Wayne's ongoing efforts to acquaint its people with things Japanese. 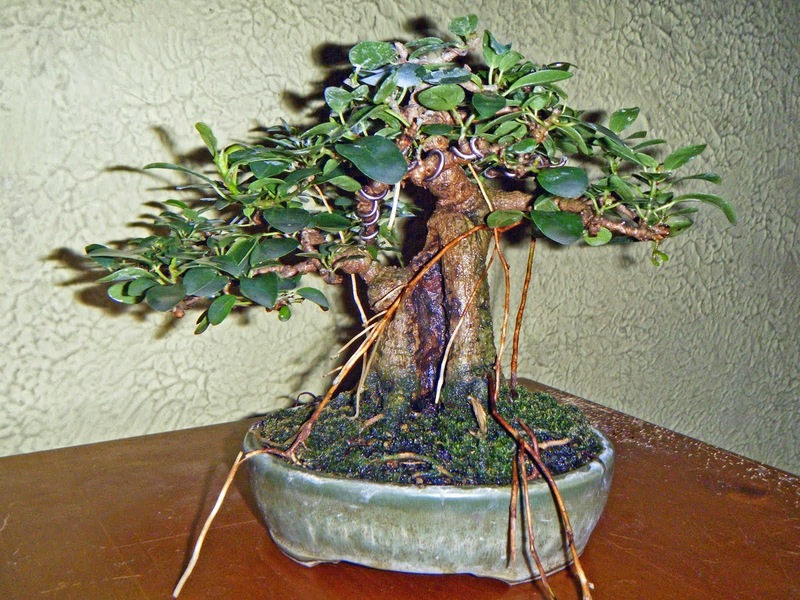 And the Fort Wayne Bonsai Club has a presence at the Festival each year, displaying trees, selling bonsai-related items, and answering questions about the art of bonsai. This year an unexpected visitor came close to stealing the show at our display. Early in the afternoon a girl of maybe six peered into the depths of Ed Hake's Japanese maple forest, turned to an adult with her and asked, "Is that toad real?" Unbeknownst to Ed, a live toad had found its way into the middle of his forest planting. It backed about two-thirds of its body under the moss cover and then settled down, presumably to wait in ambush for passing juicy bugs. Sitting motionless in Ed Hake's maple forest. A number of people peered in to see the amphibian, then went away and returned with friends to have them see it too. No one disturbed it. It continued to wait there quietly, the unplanned show-crasher. Ed took it home, in the forest, at the end of the day - his home likely being where the toad had found its way in among the maples in the first place.